Keeping up with the latest market trends is crucial for having the cutting edge on your competitors, and can even help you predict what will happen in your industry before it does, allowing you to act accordingly prior to the event. Not only does this prevent you from being blindsided by unforeseen changes, it also prevents the changes from affecting your business too severely. For example, if you are monitoring the trends in the construction industry and see that a new type of technology has been invented which promises to pour concrete quickly, smoothly and more efficiently, by being ahead of the curve and purchasing this technology before everyone else, you will have an advantage over your competitors. Another example; if a change in legislation is predicted that will mean a sudden alteration to the safety gear a construction worker has to wear, by being up-to-date with this information, you can be aware of the proposed change and start purchasing the new required gear early on, perhaps spreading the costs over a few months and lessening the blow once the legislation comes into power. The skills you could acquire in any of these courses could help you expand your company to reach new clients, run your company more effectively, or make yourself more employable if you are looking for a new position. There are plenty of resources online and in print that will allow you keep more in tune with industry changes or growing trends that you may not be aware of, especially if these trends are developing on the other side of the world. Whether you opt for official channels such as newsletters, trade magazines or journals or discuss the matter with your fellow tradesmen through online forums, blogs or discussion boards, you may be surprised at the amount you can learn simply by putting aside a few hours a week to read some relevant information. Attending conferences, industry events and training sessions will put you in touch with suppliers, customers and fellow tradesmen. Not only will this allow you learn more about your field and related industries, it will also allow you to gain insight into your competitors and the wider market. As well as this, you may find that you get to network with some people or companies that can prove beneficial to you, whether that’s through job opportunities, contracts or a special offer on tools and materials. Social media is the best way to get up-to-the-minute news as it can be updated so quickly and is accessible to everyone. We are now in an age where the biggest and best names in any industry can be contacted and their expertise shared. If you’re not already doing so, you should be following big names or brands on all social media platforms, including Twitter and Facebook. If you haven’t already started building up your Linkedin page, now is the time to do it. Linkedin allows you to build up a strong network of industry connections and is a good place to kickstart or boost a career. 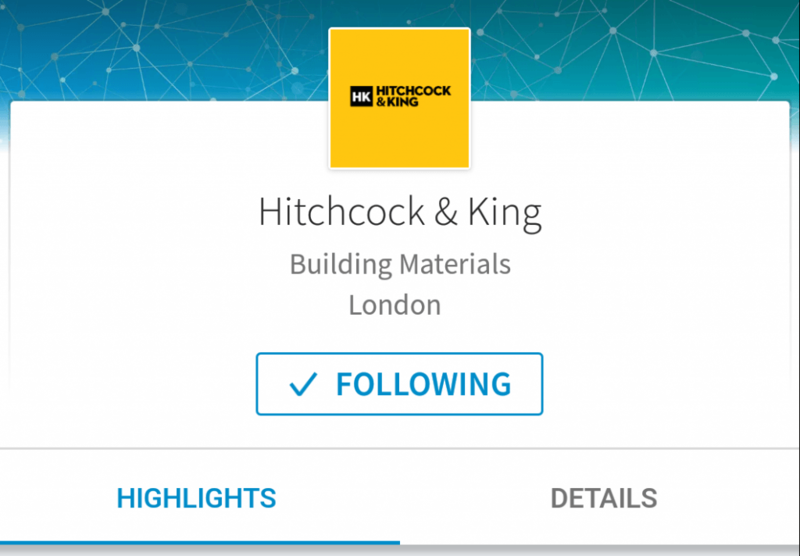 If you haven’t already followed Hitchcock & King on Linkedin, you can do so here. For building materials or timber supplies throughout London, look no further than Hitchcock & King. We pride ourselves on offering a comprehensive range of high quality supplies for any construction or renovation project at affordable prices. We operate from eight branches located across London and we offer same or next day delivery throughout London and the surrounding areas, so you never have to wait long to get your stock. Get in contact today to find out more.